Overview: The five-paragraph essay is a helpful tool — here are ideas for teaching it! Note: This post was sponsored by WriteWell. I received their service for free, and I was compensated for my time to write this post. Please be aware, however, that all opinions are my own. Thanks! In my post about high school writing, I shared the story of when my eldest daughter took the ACT and got a poor score on the writing portion. I was flabbergasted at the time. I read the essay myself, and it didn’t seem so horrible to me. She had great grammar, vocabulary, and sentence structure — what was their problem? I have since come to realize that the ACT (and SAT, for that matter) writing scorers are looking for a very particular type of essay — the five-paragraph essay. And no matter how well your child writes, if they don’t craft their ACT/SAT essay as a five-paragraph essay, then they are going to get a low score, too. So it’s a good idea to get your teen familiar with it before they need to take those tests. It is a composition that is written with — you guessed it — five paragraphs: an introduction which states a thesis, then three supporting paragraphs, then a conclusion. So a five-paragraph essay is a persuasive essay, because the writer states an opinion about something and then proceeds to back it up. It follows the standard formula that we’ve all heard many times: tell ’em what you’re gonna tell ’em (introduction), then tell ’em (body), then tell ’em what you told ’em (conclusion). 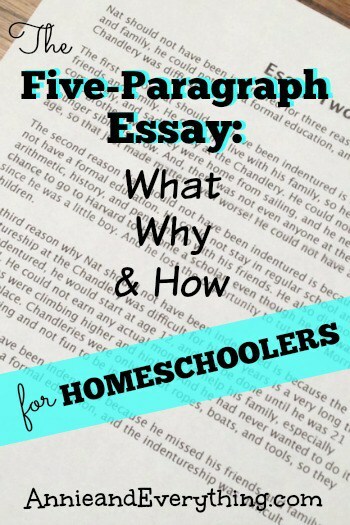 WHY teach your kids to write a five-paragraph essay? I’ve alluded to the answer to this question already — your kids will need to know how to craft a five-paragraph essay in order to score well on the writing portions of the ACT and SAT. Do I agree that it seems silly that the scorers can’t judge any other type of writing? You bet. Do I understand the myriad problems with relying on test scores for deciding a student’s adequacy for college entrance? Totally. I am not here to debate all that stuff today but just to face reality. It is what it is, y’all. Most colleges still require these tests, and if you want scholarship money for your genius, you will want him or her to do well on them. HOW do I teach my kid to write a five-paragraph essay? In my posts Homeschool High School Writing Help and Homeschool ACT and SAT Practice, I detail what we did to help my second and third high schoolers get a better score on their college entrance exams than their older sister. And they both did — and they will not let her forget it, lol. But since starting in Classical Conversations this fall, I have found out that there is another, BETTER way to tame this five-paragraph essay beast, and that is to start earlier than high school. My 12-year-old in Challenge A is learning step-by-step how to write a persuasive essay in the five-paragraph format by using the writing curriculum called The Lost Tools of Writing. And I have to say that I am very impressed with how they do this. Second, LTW assigns several essays over the course of the year, with each one being more complex than the last. The first essay is nothing more than a skeleton essay. By the third essay they have learned how to construct a thesis and find supporting arguments. Currently (in October) the students are working on finding attention-grabbing opening sentences. They will also gradually add other various literary devices such as parallelism and alliteration, among others. But Wait!! There’s More!! Seriously, there is another BIG HELP we have found for writing a five-paragraph essay (and big brother is using this, too, for his own homeschool writing) — and that is WriteWell, an online writing app. WriteWell provides an online blank paper for your child to write on. But it’s more than that; WriteWell has templates for doing all kinds of writing — including our beloved five-paragraph essay! The student can work in any order as they organize their thoughts. Clicking on one of the sections will expand it so the child can write. There they will be given a prompt, reminding them what the purpose of that section is. They are also provided with possible sentence starter ideas and “useful words.” Then when they are done they can combine the sections into a single complete essay. There are four different levels: elementary, middle school, high school, and college (and there’s also one called “Blog” — woot!). Within each level are several templates appropriate to that level, such as a science lab report for high school and a historical document analysis for college. In each case the template is divided into appropriate sections; but the student can always add or subtract sections and/or reorder them. They can save sources and make notes. My kids enjoy using WriteWell because it’s more interesting than just using a word processing program. They like not having to work in order, but still being organized. It seems easier to just “get something on paper” (so to speak, lol), which is the first, essential — but sometimes difficult — task when writing anything. For the reluctant writer, WriteWell is more motivating. And for the homeschool mom, WriteWell provides a jumping off point for coaching their child as he/she learns to write. There are three plans available: 1) Basic — FREE for one user with limit of two documents, 2) Pro — $5/mo (or $50/yr) for one user with unlimited documents, and 3) Group — $8/mo (or $80/yr) for up to five users with unlimited documents. Use the discount code BTS20 to get 20% off! You can follow WriteWell on Facebook and Twitter. The 5 Paragraph Essay is about the only writing method I remember from my (public) school years =) I remember starting it in middle school. That’s interesting that the ACT/SAT folks are only looking for that kind of essay. Clearly there are other types of writing, but I guess they know that the typical public school student is learning that kind of writing. WriteWell sounds like a neat program. Thanks for sharing about it! Thank you for writing this. I like being prepared and if our children want to go to college, then essays are something I must prepare them for. Really informative post. ? Please do not teach only this format to students who plan to attend college. It is not appropriate for college-level work. It is a rudimentary format, one that I UN-teach in my freshman composition courses. What is it the next level up, above the 5 paragraph essay, that would be important to teach in preparation for a college level paper Nathan? The research paper is probably the next step up. But I’ll confess, my eldest kids never did one of those, either. I have always been very scared of the process of teaching writing, lol. My youngest is doing one in Classical Conversations as part of her 9th grade curriculum, and I am glad about that. I believe you, Nathan. But you need to preach that to the ACT and SAT people. Until they change their standards, we kinda have to teach this to our kids. I personally think it’s a good first step towards writing longer and more researched papers. But then, yes, it is best to move on from there, and let our kids know that this was only a stepping stone. As a parent I would love to see any writing corrected instead of just a grade at the top of the paper. If 5 paragraphs is all a busy teacher can handle well with a teaching overload of students, I would rather 5 paragraphs really scrutinzed than no real editing/suggestions at all.